There are stately homes that look more modest than the estate of the Krupp family, set high over the Baldeneysee. The villa has 269 rooms and features valuable tapestries, sumptuous Italian coffered ceilings and a remarkable library. It is clear that Villa Hügel was used for representative purposes, and indeed, over the years, the Krupp family received emperors and kings, entrepreneurs and politicians here from all over the world. Above all, however, Alfred Krupp had the property built to his own designs as a hideaway for himself and his family. Building work took three years, and the Krupps moved in during early 1873. 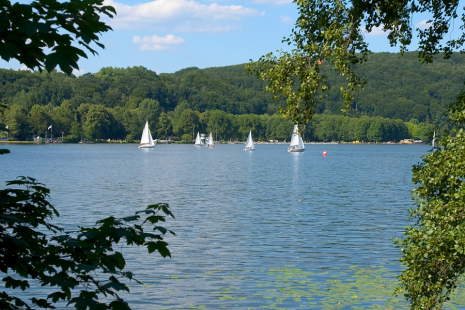 Not until 60 years later was the Ruhr dammed to create the Baldeneysee reservoir, but still the situation, above the valley and a little distance away from the family’s factories, was quiet and idyllic. After the Second World War the Krupp family opened the villa to the public. Since that time, chamber music concerts and topclass international art exhibitions have been regularly held here.